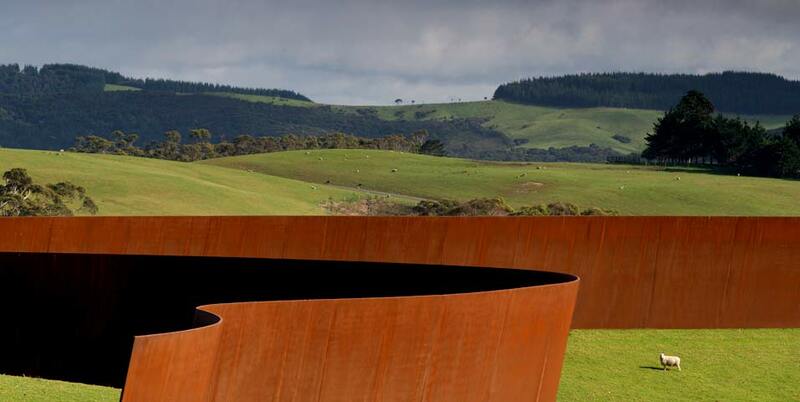 Viewed from above, the 257-metre steel wall has a delicate quality like a dark ribbon curling, almost floating. One of the features that ensures this impression is the unbroken curving line formed by the top edges of all of the steel plates which are perfectly butted together and engineered so that the whole can expand and contract with sunlight and nightfall without the slightest warp or buckling. The graceful ribbon-like deception is beguiling until one walks nearby and underneath the six-metre-high sculpture. Here the viewer is confounded by an altogether different experience. From the downhill side Te Tuhirangi Contour has all the mass of a giant dam filled with water. 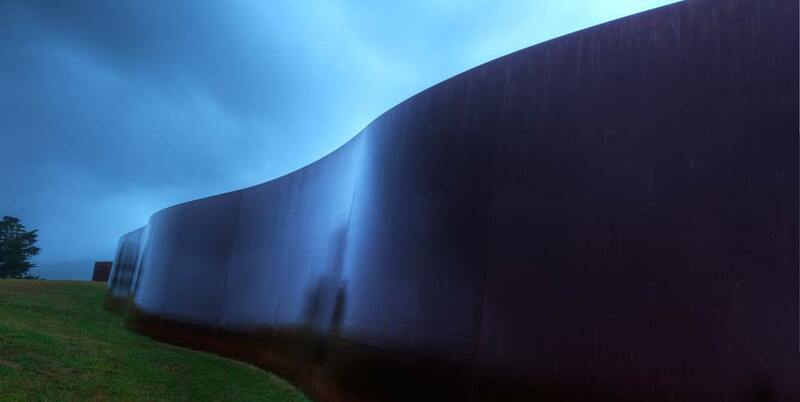 Each of the 56 steel plates leans out by 11 degrees from the vertical, which is steeper angle than Serra had ever tried before, and which was imposed by the site-specific concept itself: that the line should run at the true perpendicular to the slope of the land. So, seen from below, the materiality of mass and form impose themselves dramatically as something more felt than seen.